There's an optional backlit numpad on the trackpad, too. It wasn't all that long ago when ASUS brought out the oddly refreshing ZenBook Pro and the superslim ZenBook S, but the company hasn't forgotten its slightly more affordable offerings. For IFA this year, ASUS has updated its original ZenBook line with not only Intel's new Whiskey Lake U-series processors, but also a new four-sided, nearly frameless design with up to 95 percent screen-to-body ratio. And that's not all; ASUS still manages to tuck a 3D infrared HD camera into the top bezel, as opposed to making do with an ordinary camera farther down the body that's usually to blame for some not-so-flattering nostril shots. Another highlight of this series is the optional backlit "NumberPad" on the glass trackpad. Simply tap the top right button to toggle this virtual numeric keypad. And yes, you can still swipe the cursor around in this mode, so you don't have to keep turning the NumberPad off and on. While this is obviously a poor man's ScreenPad from the ZenBook Pro, ASUS still put some effort into this component's five-layer construction, in order to make the NumberPad invisible while disabled. My only request here is to let us quickly toggle both the NumberPad and the calculator app, perhaps double-tapping the button? 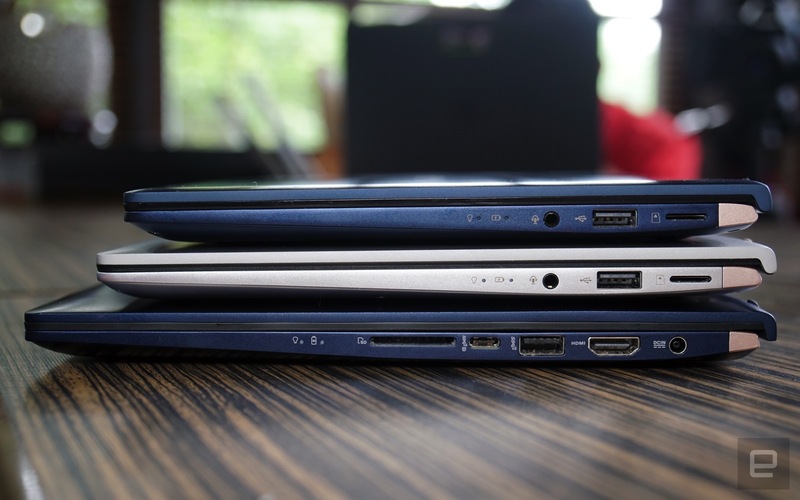 In terms of core specs, the three ZenBook models are almost identical. Underneath ASUS' signature concentric circle design you'll find a Full HD display (an anti-glare option is also available), CPUs up to Core i7-8565U, up to 16GB RAM, up to 1TB SSD and Harman Kardon-certified stereo speakers. Each laptop also has a traditional USB 3.1 port, two USB-A ports, a headphone jack and a full-size HDMI port. These machines have passed various military-grade torture tests (MIL-STD-810G) so they should age a little better than many other laptops -- in theory. The main difference between these models lies within the GPU, screen options and (even more) ports. 2018's 3.73-pound ZenBook 15 features an NVIDIA GeForce GTX 1050 Max-Q with either 2GB or 4GB of GDDR5 VRAM, instead of the weaker GeForce MX150 you'll get on the more portable ZenBook 13 and ZenBook 14. Similarly, the ZenBook 15 has a 4K display option, DisplayPort output via USB-C, a full-size SD card slot instead of microSD, plus a larger 73W battery (up to 16 hours) instead of the 14 hour battery-life of the smaller models. It also has a physical numeric keypad, which is why it lacks the NumberPad option for its trackpad. Between the three models, the 2.62-pound ZenBook 13 impressed me most. It claims to be the world's most compact 13-inch laptop, and indeed, its dimensions plus weight just about beat the Dell XPS 13 which we highly regarded. The bezel comes in at just 2.8mm thick on either left or right side, with the bottom side also trimmed down to 3.3mm, whereas the top side border measures 5.9mm which is still impressive given the webcam placement. Typing on this machine is a joy courtesy of its 1.4mm long key travel, full-size key pitch plus keyboard tilting via the lid's "ErgoLift" hinge; and thankfully, the same applies to all three models. ASUS also announced two new convertibles alongside the three ZenBooks: The ZenBook Flip 13 (UX362) and ZenBook Flip 15 (UX562). 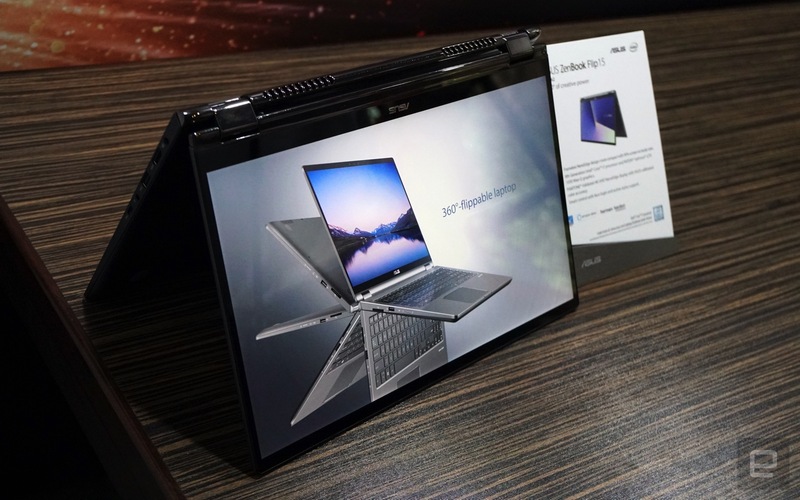 Both models share near-identical specs as their ZenBook counterparts, with the main difference being the added touchscreen support, the lack of a discrete GPU on the Flip 13, a larger 86Wh battery option on the Flip 15, plus an optional world-facing full HD camera on both versions. Understandably, their weights are bumped up to 2.87 pounds and 4.19 pounds, respectively. As usual, ASUS has yet to share details on pricing, but what we do know is that all five laptops will be hitting stores starting in Q4 this year. We'll share more here when ASUS gets back to us with fresh info.